The use of mobile devices is on the rise with trends only expected to increase exponentially for the foreseeable future. According to statistics gathered by the ad network InMobi, more people are accessing the internet via mobile devices, making them the most used medium for going online throughout the world. Clearly the amount of mobile users accessing the internet is on the rise and according to a three-part study done by iAcquire in 2013, the overwhelming majority of searches done on a mobile device result in an action taken within just one hour. If mobile users come across a search result that is not mobile friendly, about half of them go to the next result. The internet marketing industry’s leading authorities expect mobile use to continue to rise at an incredible pace which makes mobile users a very important target for internet marketing campaigns. Building a mobile responsive website is a great first step to ensure that your site is displayed properly on all mobile devices including tablets and smartphones. Many traditionally built websites do not display well on mobile devices and as the statistics mentioned above from iAcquire show, mobile users are much more likely to leave your website if it is not mobile friendly. Therefore, it is crucial to implement a responsive design that will allow your website to adjust its display for tablets and smartphones and create a better user experience. The web design and development team of Proceed Innovative can build custom mobile applications and responsive designed websites for your business that will help you appeal directly to the growing pool of mobile users. Increasing Business Opportunities: Long gone are the days when customer interaction only happened in person or over the phone; mobile applications means that your business is open 24 hours a day. At any point throughout the day, a mobile user can get on your app for information or to make a purchase. Improving Customer Relations: Mobile applications are a great medium for establishing customer relations because they allow customers to engage directly with your brand at any time. A well-built mobile app will also encourage users to communicate with you directly and respond to your Call to Action. Improving Customer Experience: One of the keys to internet marketing is providing an excellent customer experience and mobile applications are built for improved user experience with their convenient, mobile friendly interface. Also, mobile apps are saved on individual devices and do not require an internet connection to function so users can access them at any time. The benefits that mobile applications can have for your business along with the growing trend of mobile users makes mobile applications an option worth considering for your internet marketing campaign. 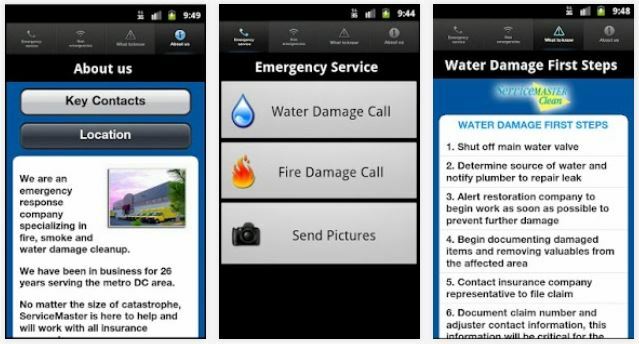 Proceed Innovative has built several mobile applications for our ServiceMaster clients that allow users to make direct emergency calls, find important information regarding disaster recovery, and submit non-emergency forms with pictures of the damage. You can check out these mobile apps available for download on the Google Play Store. Mobile presence is a very important element of a good internet marketing campaign and Proceed Innovative can help you boost your mobile presence with responsive website design services and mobile applications. Mobile users are the fastest growing demographic of internet users which makes it important for you to establish a strong mobile presence.